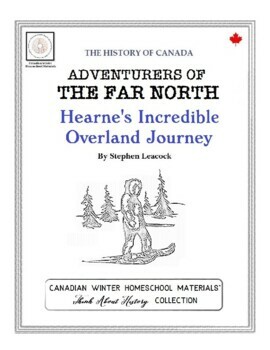 ‘Hearne’s Incredible Overland Journey’ is the second chapter of Stephen Leacock's ‘Adventurers of the Far North’, which contains accounts of the historic voyages to the northern regions of what is now Canada. 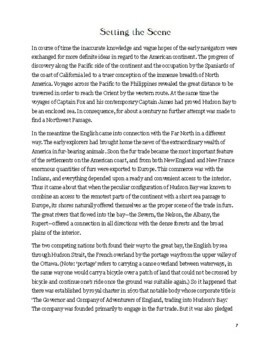 This chapter describes the three amazing overland journeys made by Samuel Hearne on behalf of the Hudson’s Bay Company, in search of a copper mine and a Northwest Passage. Though neither was found, Hearne’s adventures, as recounted in his own journal in detail (and quoted in Leacock’s book), became an iconic account of northern survival. It also offers descriptions of encounters with First Nations that provide unique food for thought, as they reveal the widely varied behaviours of these people toward one another and toward Europeans. The tone of the writing is neither formal nor chatty, but invites the reader to take an interest in a topic for which the author evidently had a genuine passion. This book contains chapter two from ‘Adventurers of the Far North’. For study purposes, it has been divided into 12 short sections, each 1-3 pages long. After every section there are 10 reading comprehension questions about the text, to be answered after reading that section. These are meant to help the student to remember and understand important facts. There are also at least two questions under the heading ‘Thinking About the Details’. These ask that the student find a specific small segment of the text which has been underlined (page numbers are given) and answer pointed questions about that small piece of writing. These questions focus on writing style, word choice, intent and tone. Sometimes the student may be asked to verify facts. The purpose is to encourage the student to think critically about history and historical writing. 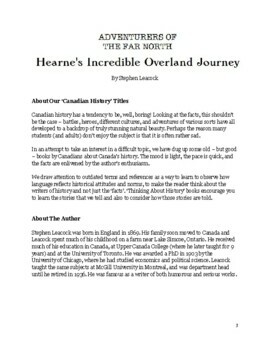 After the main text and assignments there is a blank map of Canada, which can be used by the student to make a visual representation of what they have learned from reading and thinking about ‘Hearne’s Incredible Overland Journey’.